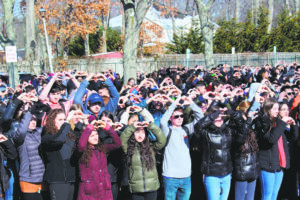 Plainview students create hand-hearts as a sign of solidarity during the 17-minute observance. 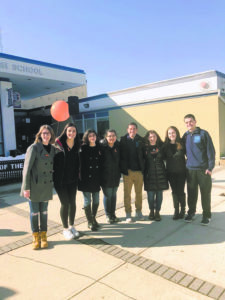 The students at Plainview-Old Bethpage John F. Kennedy High School joined much of the nation last week when they left class for 17 minutes in the National School Walkout, honoring victims of a mass shooting and learning about civic engagement while the school district reaffirmed its safety and security measures. The organized memorial on March 14 commemorated the lives of the 17 victims of the mass shooting last month at Marjory Stoneman Douglas High School in Parkland, FL. 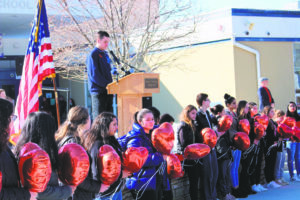 The ceremony was held outside of the POB-JFK front doors, where students said the Pledge of Allegiance, student leadership spoke of each life lost and 17 orange balloons were held aloft and released at the completion of the memorial service. Plainview schools Superintendent Dr. Lorna Lewis said the respectful gathering was a heartening and inspiring action to witness. Senior Matthew Wolson delivers remarks to his fellow classmates during the walkout. In addition, the district used the events of the day as an opportunity to conduct a 10-minute lockdown drill in each of the nine periods in the middle and high schools to educate students on the proper procedures to take in case a lockdown should occur. This was an effort to go beyond the state mandate of four lockdown drills per school year and help the students to understand where to go in case a lockdown happens at any point in the school day. The day of civic engagement lessons conducted throughout the district was an effort to help students understand the science behind social change and give them an opportunity to use their voices in a larger social context. The district’s initiative to give students a voice is part of their ongoing efforts to have children understand their power to invoke social change. The events at Plainview stood in stark contrast to what occurred at Hicksville High School, where students were barred from participating with guards stationed at doors to prevent students from walking out. Principal Raymond Williams said the school “does not encourage or condone a walkout” and would instead hold a “day of unity,” where students were encouraged to wear school colors, engage in in-class discussions or sit in silent reflection for 17 minutes.